Ancestral home of the Direfrost clan, this frozen castle has long been sealed to the outside world, its owners neither seen nor heard from in generations. Mountain storms rage above the castle walls, conjured up by some unknown malignant power. 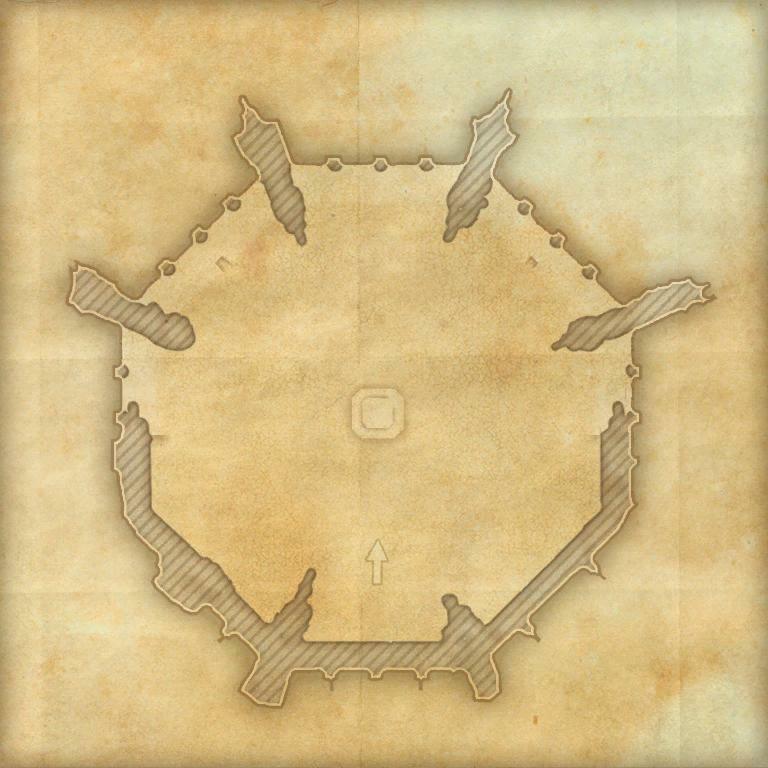 Direfrost Keep is a group dungeon found in Eastmarch. Once the ancestral home of the witch hunting Direfrost clan, the castle has been abandoned following an attack by the ice witch Drodda. A surviving member of the clan, Eboric Direfrost, needs your help to reclaim his home. You can learn about its location from Untouchable Naim outside Velyn Harbor, Twice-Lucky in Sentinel, or Felvyn the Swordarm in Windhelm. Its dungeon sets are Draugr Hulk, Magicka Furnace, and The Ice Furnace. 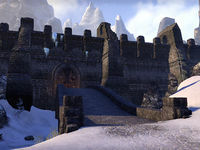 Direfrost Keep Objective: Explore the Direfrost Keep. These named enemies have two pips around their health bar to indicate their difficulty. These named enemies have three pips around their health bar to indicate their difficulty. 5 items: When you take damage from a melee attack while you are under 80% Magicka, restore 93-8000 Magicka. This effect can occur once every 30 seconds. 5 items: When you deal direct damage with a Frost Damage ability, you have a 50% chance to deal an additional 34-997 Flame Damage to all enemies within 8 meters around the initial target. This effect can occur once every 1 second. 2 items: When you deal Critical Damage, you have a 20% chance to gain a damage shield that absorbs 100-8600 damage for 6 seconds. While the damage shield holds, you deal 8-770 Frost damage to all enemies within 5 meters of you every 1 second. This effect can occur once every 6 seconds. Direfrost Keep Vanquisher 10 Defeat the Guardian of the Flame, the Empowered Frost Atronach, and Drodda of Icereach at Direfrost Keep. Direfrost Keep Conqueror 15 Complete Veteran Direfrost Keep by defeating Teethnasher the Frostbound, the Guardian of the Flame, Drodda's Apprentice, Drodda's Dreadlord, Iceheart, and Drodda of Icereach. A Dish Served Cold 50 Defeat Drodda of Icereach in Veteran Direfrost Keep, after invoking the Scroll of Glorious Battle. Veteran Draugr Slayer 10 Defeat 325 Draugr in Veteran Direfrost Keep. Veteran Frozen Skeleton Slayer 10 Defeat 350 Frozen Skeletons in Veteran Direfrost Keep. Direfrost Keep Survivor 50 Defeat Teethnasher the Frostbound, the Guardian of the Flame, Drodda's Apprentice, Drodda's Dreadlord, Iceheart, and Drodda of Icereach in Veteran Direfrost Keep, without suffering a group member death. Direfrost Keep Assassin 50 Defeat Teethnasher the Frostbound, the Guardian of the Flame, Drodda's Apprentice, Drodda's Dreadlord, Iceheart, and Drodda of Icereach in Veteran Direfrost Keep within twenty minutes of starting the dungeon. Timer starts when any player enters the first bear-filled cavern. 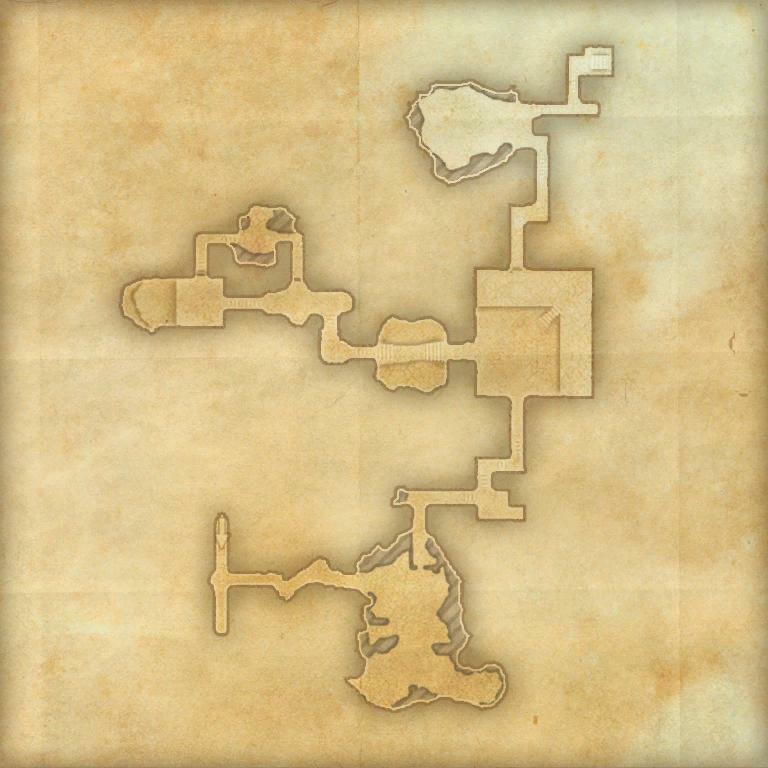 Before dungeon scaling was introduced in Update 5, Direfrost Keep was designed for levels 34–37.